Autodesk University Planning Week and an AutoCAD Hip Tip! Well we've been plugging away all week working on the content for Autodesk University 2008. With over 600 courses and over 1400 submittals we want to make sure we have the best possible slate of classes. Joseph Wurcher, June Nakatani and Matt Olding have been locked up together in a room for three days now - two to go! We are all going to need a break from each other after this for sure! So who is going to get voted off of American Idol this week? Sorry to say it but I REALLY hope it's Jason. I know he has his fans but I think he's the least talented of those who are left. I absolutely believe it will get down to the two David's but can't we please keep adorable Sayesha for just one more week? Please??? Another of my Tuesday Tips and Tricks videos came out yesterday - this one was on Design Center. Design Center is one of those tools that I find so many of us have forgotten about! It's actually quite a powerful tool that makes it easy for us to mine data from one drawing to another. Did you make a great dimension style in a previous drawing that you'd like to use in your current drawing? Design Center to the rescue! The easiest way to get to Design Center is with Ctrl+2. You can also get to it from the Tools menu, from a toolbar, or the new ribbon if you prefer. Using Design Center simply navigate to the drawing you'd like to grab some data from and you'll see a listing of the all types of things you can bring into your current drawing: blocks, layers, table styles, dimension styles, layouts, linetypes....the list goes on and on. 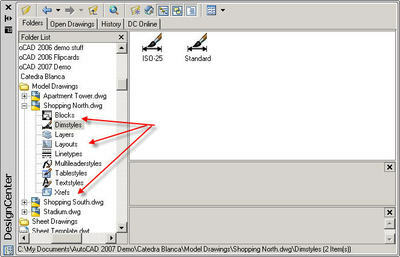 Simply select the category you want and right click on the data you want to add to your drawing. Below I've selected a layer and accessed "Add layer" from the shortcut menu. 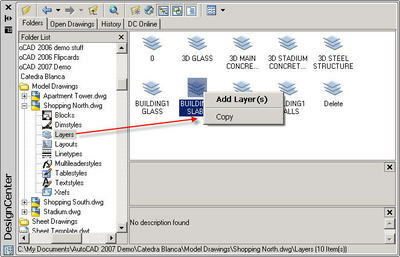 Depending on the category you can highlight multiple items to migrate over to your current drawing. It's just that simple - so don't recreate your data - use Design Center! To see me demonstrate this tip be sure to go to the Cadalyst Tips and Tricks video.